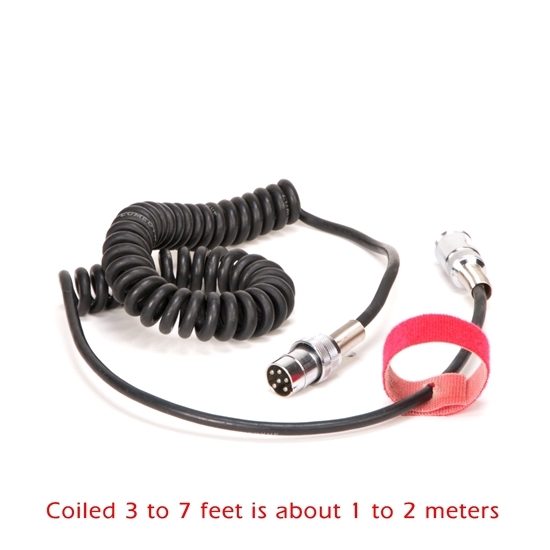 This coiled extension cord for the Lumedyne Heads is about 3 feet long before you start to stretch it and can easily stretch to about 7 feet. It has the silver round Head plugs at each end; one male for the Pack end and one female for the Head end. This is a direct Head Cord for the Signature Heads and an extension cord for the other Heads that have a cord already. If you have a Signature Series Head this is a good short coiled cord. If you have a desire for slightly longer and yet flexible Head extention cord, this is a good solution for you. Many photographers who choose this style cord desire the coils to stay near the lightstand or their body but perhaps they might have a 10' or higher stand and one cable isn't long enough, then adding this one does allow seven plus feet of springy extension while keeping the Pack as low as possible on the light stand. If you strech the cord beyond about seven or eight feet long it might not spring back to the same tight loops as originally and don't recommend trying to stretch it at all beyond ten feet long or the wires at the ends could be put in jeapardy with too much spring presure. Also at that distance the cable will never retract to its new short tight coils again.